The following is paraphrased from the memories of Frances (née Patz) Craig, daughter of Edward Martin Patz, Sr., and granddaughter of John Joseph and Clara Louise (née Sawyer) Patz. I don't know anything about the education of my grandparents or about any employment for my grandmother, Clara. I'm pretty sure she didn't work after she was married. 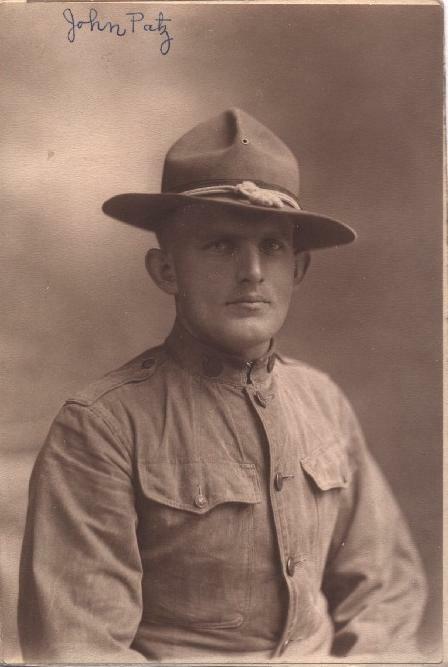 My grandfather John served in the US Army during World War I, then went home with his bride to Buffalo. That didn't work out, so he brought her home to East Boston -- to an apartment, I think, just around the corner from her parents. 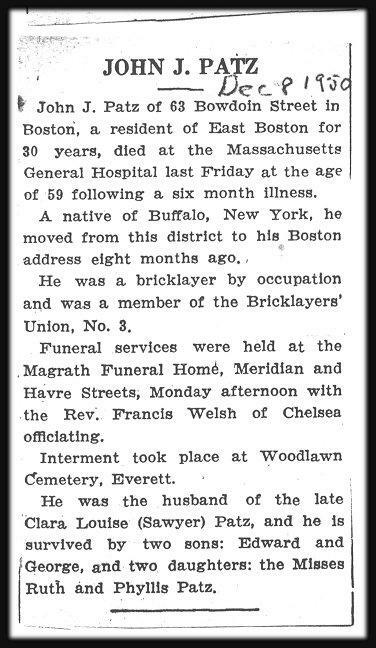 John worked as a "brickie" for Edison in South Boston, repairing the big boilers with the old yellow firebrick. My father, Edward, worked with him for several years, then went freelance after John died. Edward was always afraid that the brick dust at Edison had contributed to John's death. John used to love playing solitaire after dinner, while having a drink and smoking a cigar. One of his favorite snacks was lard spread on bread and sprinkled with salt (ugh!). Nana (Clara) loved her radio "soaps." I remember them playing on the radio every time we visited them in the daytime. 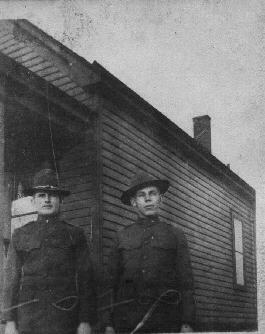 John and Clara lived just up Falcon Street from us, about 1½ blocks away. I don't ever remember either of them reading, or Nana doing any handwork besides mending. I think that having four kids kept her very busy! They had a dog, a smelly old blond cocker spaniel named Queenie, and a parrot -- I think its name was Polly. I don't remember much about my grandparents, because Nana died when I was 5 and Grampa just a few years later -- and so my memories are those of a young child. I know Nana had kidney trouble her whole adult life, and died of kidney failure. I don't ever remember my grandfather being sick, until he got cancer. 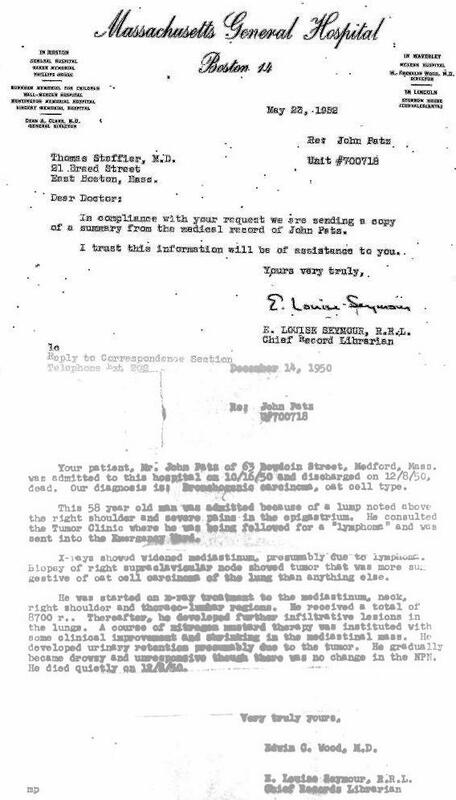 He died of Hodgkins disease. After Clara died, when her girls were in High School, Phyllis came to live with us. 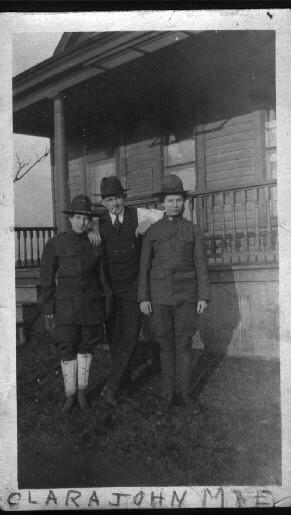 Ruth and my grandfather lived with George and Gladys. 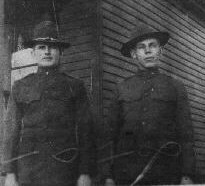 John Joseph Patz and Frank August Patz in World War I uniforms. (No date). 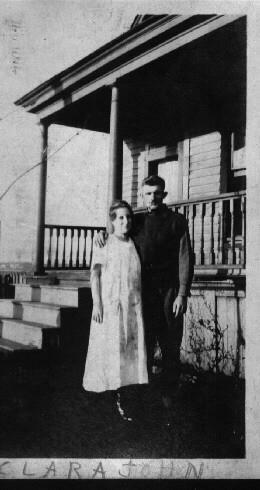 Clara (née Sawyer) and John Joseph Patz at 267 Colorado Street, Buffalo, NY. (No date). 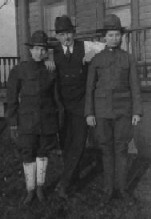 Clara (née Sawyer) with John Joseph Patz and Mary Rosalia("Mae") Sahr. (No date). Edward Martin Patz, Sr.: Born 1919; died 1997. George Junior Patz: Born 1921; died 1991. Ruth Elizabeth (née Patz) Williams: Living. Phyllis May (née Patz) Cassaro: Living. 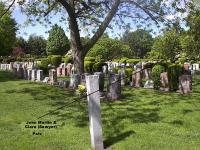 General location of the gravesite of John Joseph Patz and Clara (née Sawyer) Patz, Woodlawn Cemetery, Everett, Massachusetts. 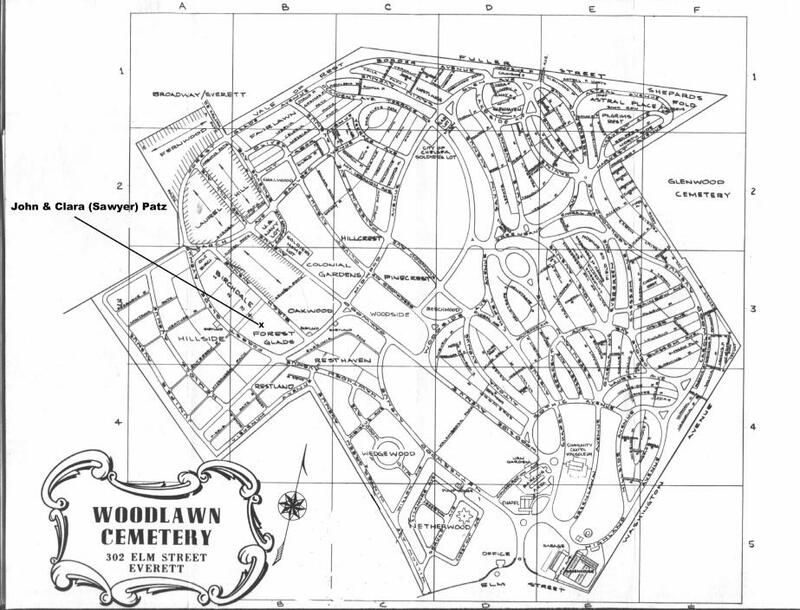 A map to locate the gravesite is available here. 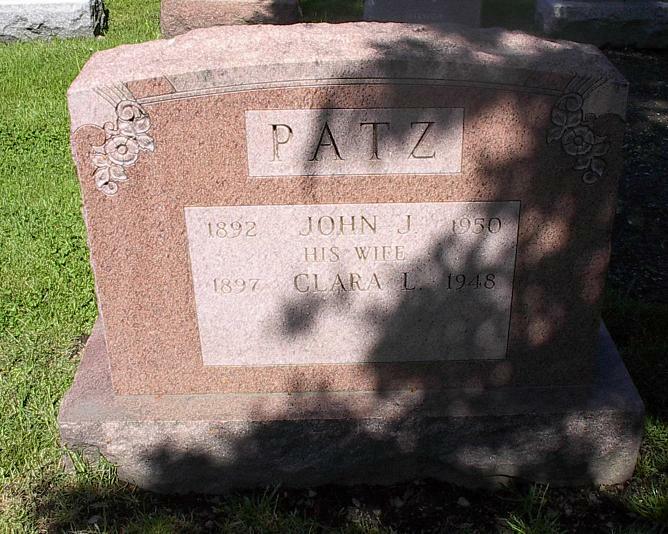 Grave of John Joseph Patz and Clara (née Sawyer) Patz, Woodlawn Cemetery, Everett, Massachusetts. Baptismal Record: John Patz, born and baptized on July 12, 1892. Baptised by Fr. 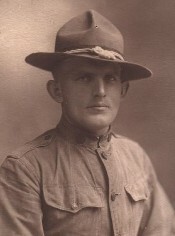 Ferdinand Kolb of Saint Boniface R.C. Church, 124 Locust Street, Buffalo, NY. Birth Certificate: John Patz, born July 12, 1892. 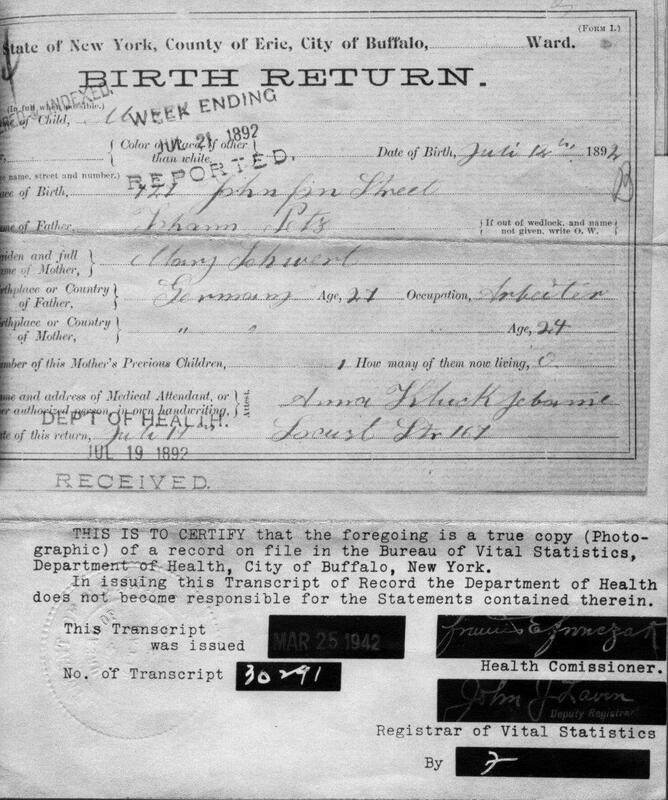 Birth was at home: 427 Johnson Street, Buffalo, NY (the address is difficult to read on this birth certificate, but the accuracy of our interpretation is confirmed by the address on the death certificate of Anna Susan Patz (born 1896). 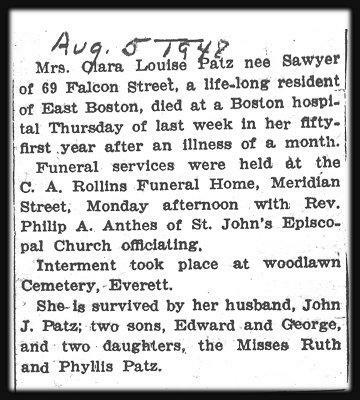 Obituary: Clara Louise (née Sawyer) Patz, died August 5, 1948. 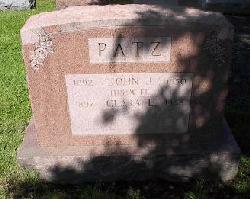 Obituary: John Joseph Patz, died December 8, 1950. 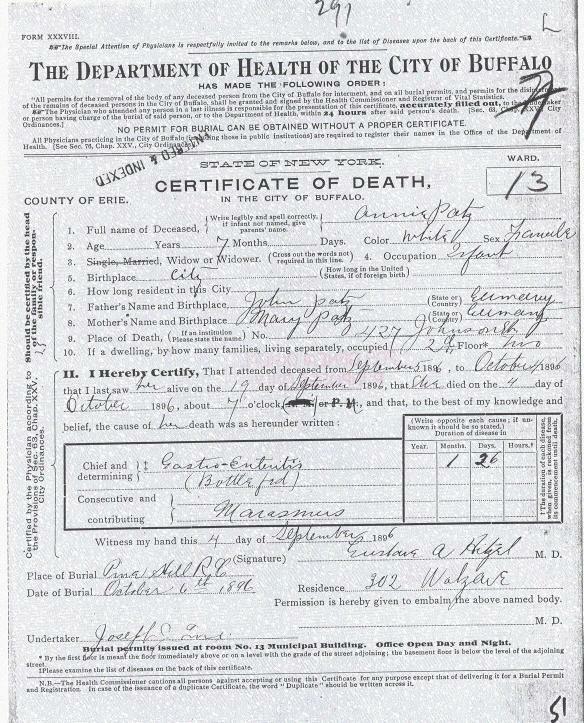 Death Record: John Joseph Patz, died of cancer on December 8, 1950, Massachusetts General Hospital, Boston.